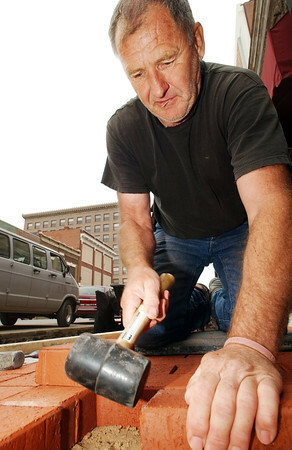 Darel Biggers of Fairgrove, a landscaper with C&S Landscaping of Fairgrove, hammers one of approximately 24,000 ornamental sidewalk bricks into place on Main Street in downtown Joplin Wednesday afternoon, April 26, 2006. The landscaping crew reported they were laying around 300 yards of bricks on each side of Main Street between Fourth and Sixth streets, which covers approximately 4,700 square feet. Section: News Story: unknown -- community shot?